We study the generation of supercontinua in air–silica microstructured fibers by both nanosecond and femtosecond pulse excitation. In the nanosecond experiments, a 300-nm broadband visible continuum was generated in a 1.8-m length of fiber pumped at 532 nm by 0.8-ns pulses from a frequency-doubled passively Q-switched Nd:YAG microchip laser. At this wavelength, the dominant mode excited under the conditions of continuum generation is the LP11 mode, and, with nanosecond pumping, self-phase modulation is negligible and the continuum generation is dominated by the interplay of Raman and parametric effects. The spectral extent of the continuum is well explained by calculations of the parametric gain curves for four-wave mixing about the zero-dispersion wavelength of the LP11 mode. 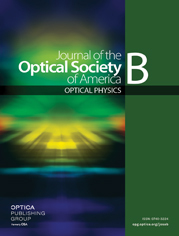 In the femtosecond experiments, an 800-nm broadband visible and near-infrared continuum has been generated in a 1-m length of fiber pumped at 780 nm by 100-fs pulses from a Kerr-lens model-locked Ti:sapphire laser. At this wavelength, excitation and continuum generation occur in the LP01 mode, and the spectral width of the observed continuum is shown to be consistent with the phase-matching bandwidth for parametric processes calculated for this fiber mode. In addition, numerical simulations based on an extended nonlinear Schrödinger equation were used to model supercontinuum generation in the femtosecond regime, with the simulation results reproducing the major features of the experimentally observed spectrum.